While comprising a group of Germanic tribes from continental Europe, the Anglo-Saxons established themselves in Great Britain from the 5th century. This consequent Anglo-Saxon epoch (from roughly 449 – 1066 AD) led to the creation of the English nation and the resurgence of Christianity in Britain. And even beyond culture and religion, one of the lasting legacies of these Germanic people is their contribution to the ambit of language – what we know today as Old English. However in this article, we have decided to explore one of the lesser known avenues relating to the Anglo-Saxons, and it pertains to their incredible military that bridged the gap between the ancient ‘barbarian’ Germans and the ordered medieval armies. So without further ado, let us take a gander at ten fascinating things you should know about the Anglo-Saxons and their warriors. While the diminishing of the Roman imperial rule set the tone for the arrival of the Anglo-Saxons at the shores of the British islands (circa 5th century AD), it should be noted that the late Roman Empire already followed an ‘inclusive’ military doctrine that allowed the employment of auxiliary units. By the 4th century, in the northern frontier, these auxiliary units were often composed of entire Germanic sub-tribes, who were settled as foederati (allied troops) in marches, buffer zones, and areas of conflict. During the same time period, the Romans (or Romano-British) had already begun to set up coastal defenses to protect their shores from the forays of the independent Anglo-Saxon tribes. So in a sort of chaotic twist, while many of the Germanic sub-tribes from the proximate area were serving as the foederati of the Romans, the independent Anglo-Saxons were themselves raiding the Roman (or sub-Roman) territories. But given the predominant influence of the Roman military, these Germanic armies on both sides were often equipped in similar fashions akin to the Roman auxiliary units. In fact, the continuation of Roman style and influences on the German foederati could be seen even in the equipment of the later 7th century Anglo-Saxon armies. In the chaotic scope of large-scale Germanic migrations to Britain, the tribal warlords and ‘kings’ tended to gather their bands of chosen warriors, both for the purpose of protection and intimidation. 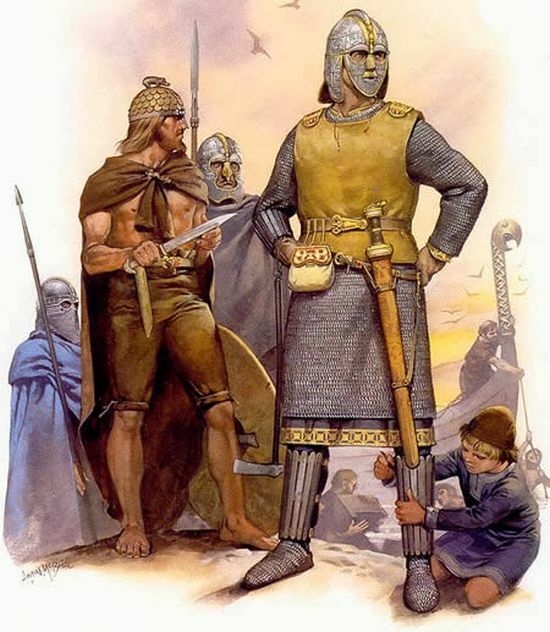 As historian Mark Harrison discussed (in his book Anglo-Saxon Thegn 449-1066 AD), the followers were probably selected from the general population, and on chosen were offered the high-status of hearthweru (or heath-guard) warriors. 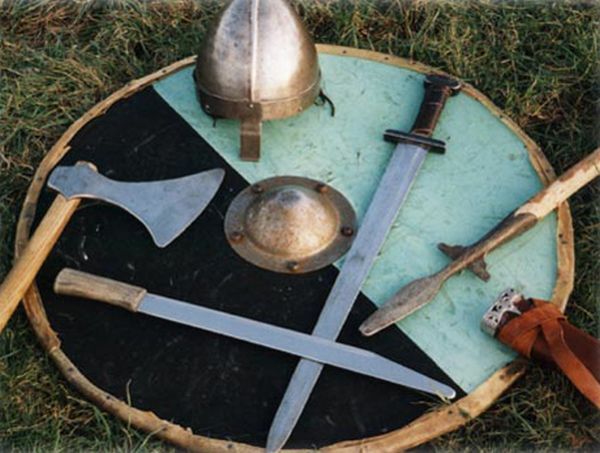 Suffice it to say, these men had the best of equipment and weapons in the Anglo-Saxon military circle, while they were also counted among the household troops of the kings and princes who could afford to train in a dedicated manner for the ‘business’ of war. 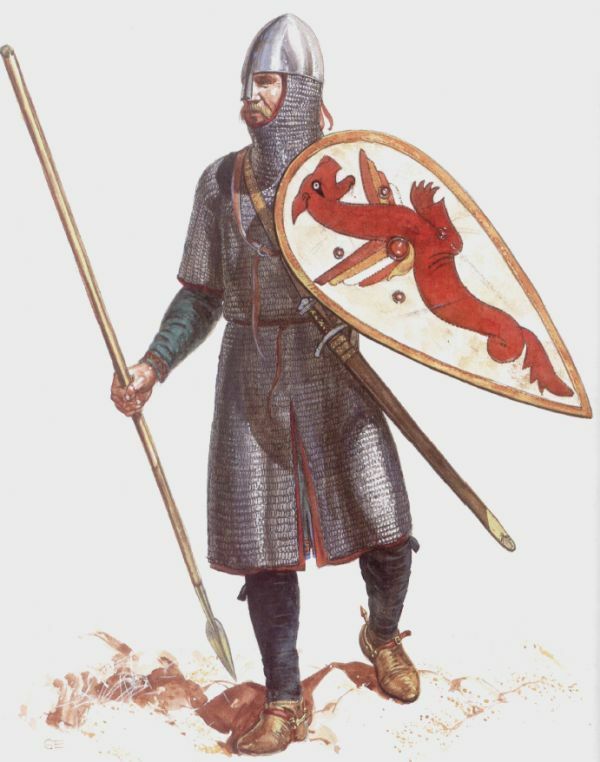 Interestingly enough, while the later medieval armies of England (and other western European realms) were mostly composed of a core of the bodyguard and ‘knightly’ units, who were surrounded by far higher number of supporting troops, the hearthweru warriors of the Anglo-Saxons often formed the bulk of the army (at least in the initial periods). Now it should be noted that the term ‘army’ in itself is pretty vague, especially since the 5th-6th century armies of the Anglo-Saxons were very small. For example, in the fragmentary poem of Fight at Finnsburh, an army is mentioned to only have 60 men. Similarly, some modern historians like Pete Sawyer have taken the etymological route in defining what actually constituted an ‘army’ – with one of the Laws of King Ine of Wessex (issued in 694 AD), defining an here or army as consisting of only 35 men! So by taking the credible route, we can assume that the early Anglo-Saxon warlords only had armies numbering in hundreds, and these troops mainly comprised the chosen war-bands of the leaders. Fyrd or levy was a pretty old Germanic custom that simply entailed the conscription of all (or most) able-bodied men during times of large-scale wars and encounters. But of course, by later 7th-8th century AD, most of the Anglo-Saxon population groups were peacefully settled in agricultural lands, thus leaving obvious gaps in a dynamic military system headed by the political elite. Simply put, while the earlier chaotic times during migrations and settling (in the British islands) were dominated by the small number of hearthweru warriors, by the 8th century the Anglo-Saxon leaders had their established kingdoms. So in a sense, greater logistical efforts were required to protect their lands and conduct wars (though conflicts were rarer). As a result, the Anglo-Saxon rulers implemented the general fyrd, like in the Laws of King Ine of Wessex that mentioned the summoning of all free-men between the ages 15 and 60 for military service when required. However, over time the general conscription of the male populace was a not viable economic scope since it directly affected the agricultural labor required for yearly cultivation. 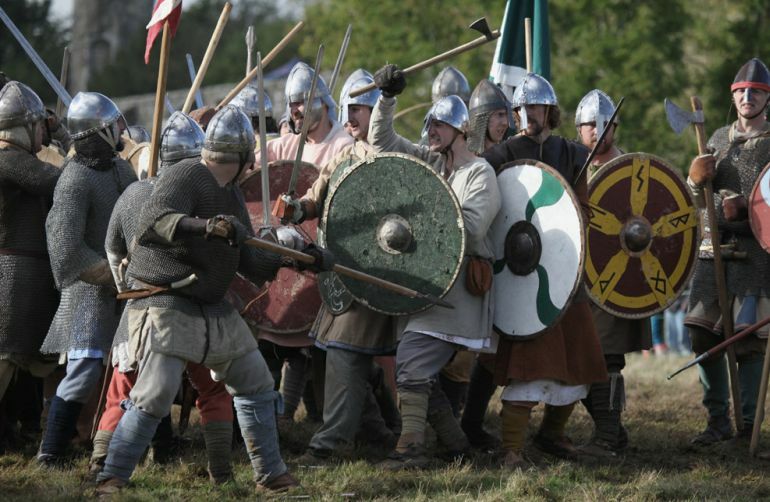 So as a solution, the Anglo-Saxons began to implement what is known as ‘select fyrd’, which basically entailed a smaller number of men who were conscripted, thus leaving a significant number behind for sustaining agricultural activities. Consequently, this smaller (yet manageable) fyrd was better equipped and provisioned, while also being better drilled and supervised by a greater number of thegns (originally meaning servant, but actually pertained to a class of nobleman-warrior). In the crowning years of Anglo-Saxon rule in England, the military scope brought forth a new institution of warriors – and they were known as the huscarles or huscarls (Old Norse: húskarlar). Interestingly enough, they were initially Scandinavian in origin, and as such served the roles of bodyguards and household troops of Norse warlords and kings (huscarls translates to household men). In other words, their roles both on the battlefield and in peacetime society were pretty similar to the aforementioned hearthweru warriors. However, as opposed to a strictly Anglo-Saxon identity, these huscarls served their Scandinavian overlords (like King Cnut who ruled over England and Denmark) by the early part of 11th century AD. That doesn’t necessarily mean that the huscarls only inducted Scandinavians in their ranks. 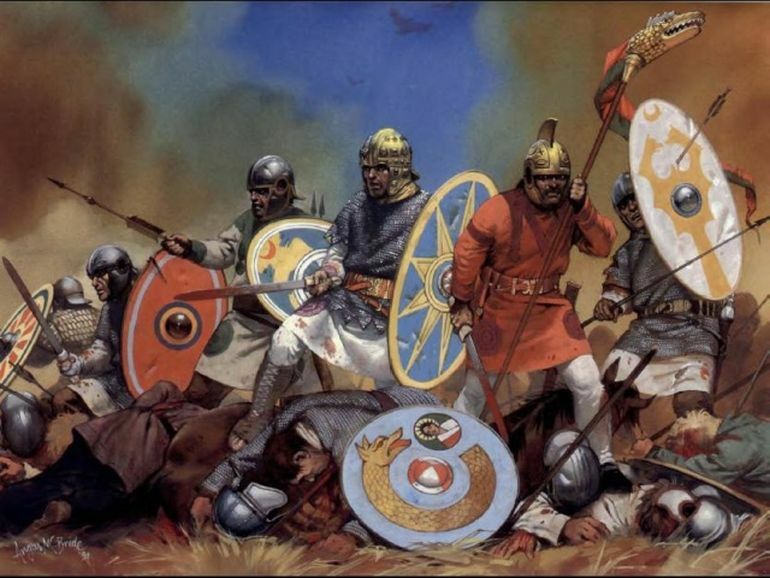 To that end, Cnut’s huscarl units probably included the ‘English’ Anglo-Saxons, thus alluding to a unique scope of ‘mixed’ divisions – suggesting how Old English and Old Norse were similar enough for tactical functioning on a battlefield. And in the following years, the huscarls also took up many administrative positions as the landholding class, even when the English throne passed into Anglo-Saxon hands (circa 1042 AD) after the Scandinavian interlude. Now beyond their mixed heritage entailing both English and Scandinavian influences, it is a possibility that some of the later huscarls were paid warriors – thus making them professional soldiers. The trend of employing the paid huscarls would have been more common during the conclusive years of the Anglo-Saxon rule when the crown sometimes even raised mercenary armies. But the traditional húskarlar were supposedly only paid in gifts (as opposed to monetary compensation) by their overlords. In one of the earlier entries, we fleetingly mentioned how the thegns were a designated class of nobleman-warrior, who were placed somewhere between the free-men and the hereditary nobles of the Anglo-Saxon society. In any case, over time the role of the thegns often became more ‘civic’ in nature with their capacity as the officials of the crown. Such changes didn’t really exempt them from military service, as most of them were still free-men and landholders (and thus thegns were often the commanders of the raised fyrd). Moreover, since the title of a thegn was not officially hereditary, on the death of a thegn, his successor had to ‘pay’ the crown a gift known as the heriot or death duty, in order to retain his lands. According to Harrison, this death duty mostly entailed military equipment (though often substituted by monetary payment) that was supplied to the crown, which signified that even on the death of a thegn, the king didn’t lose a warrior. Consequently, these supplied arms and armaments were used by members of a select fyrd or by paid mercenaries. In that regard, by the end of 10th century AD, the heriot of a royal thegn (a high-ranking thegn who directly served the king) comprised four shields, four spears, four horses (two of them being saddled), two swords, a helmet and a coat of mails. When not engaged in warfare they spend a certain amount of time in hunting, but much more in idleness, thinking of nothing else but sleeping and eating. For the boldest and most warlike men have no regular employment, the care of house, home, and fields being left to the women, old men, and weaklings of the family. In thus dawdling away their time they show a strange inconsistency – at one and the same time loving indolence and hating peace. And while the Anglo-Saxon warriors emerged in Britain more than four centuries after the said observation, their German roots were quite evident, especially when it came to the social side of affairs. To that end, most men of the warrior class, even of the average station, were loath to farming, given its assumed status as a menial task. 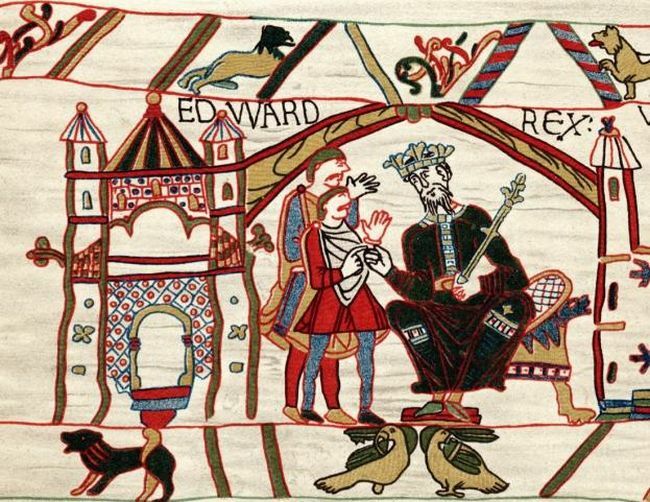 But of course, over time when the Anglo-Saxons became more settled, practicality demanded economic scenarios where many of mid-ranked thegns would give up their swords in return for provincial estates that oversaw farming. But the heall (long-hall) remained the focus of social activity for high-ranking warriors, with the structure’s central location within a lord’s estate. In fact, in many cases, the heall was the residence of the lord and some members (and companions) of his hearthweru. Suffice it to say, the hall with its large open space and central fireplace, became the hub where these high-ranking warriors feasted, drank, planned battles, and even argued and fought. These activities were often complemented by recreational stuff, including the distribution of chosen gifts and the recitations of war-poetry. Now, of course, not all warriors resided within the heall, with the very senior members (duguth) being often allocated different lands and estates. In the last entry, we talked about the lords of the Anglo-Saxon warrior community. Now the very term ‘lord’ is derived from Old English hlaford, which roughly translates to ‘loaf guardian’. Simply put, the host handing out the bread to his followers signified symbolic ties and loyalties between the lord and his warriors. 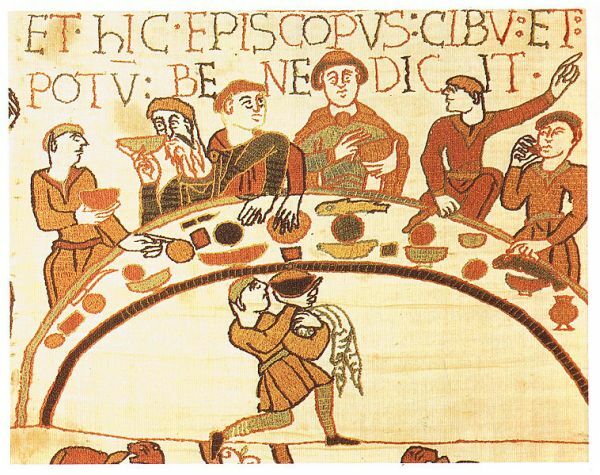 With the all the talk about feasting and loaves of bread, it should be noted the Anglo-Saxon diet was rich in protein with higher proportions of consumed meat. This was of course complemented by alcoholic concoctions, most notably the mead – made from honey, spices, and grains. In fact, the term mead (or medu in Old English) was so ubiquitous that it was probably used to refer to many alcoholic drinks. And its popularity was followed by drinks like malted ale, known as mealtealoth. 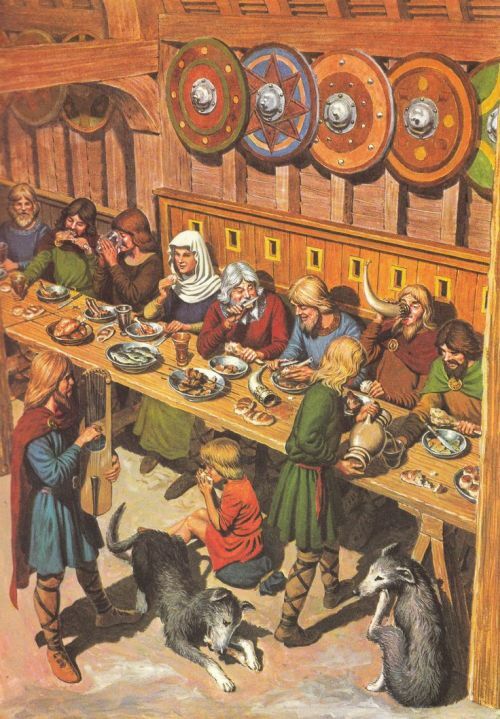 Now while the feasting and drinking did their bit to alleviate the travails of the soldiers and officials, these customs also mirrored the hierarchy within the warrior circle of the Anglo-Saxons. For example, seating arrangements along the table set by the lord reflected the statuses of the individual royal thegns, with the closest ones (to the leader) also replicating their positions on actual battlefields. But of course, even beyond the hidden significance and symbolism, these recreational activities more-often-than-not acted as bonding exercises where the senior military men communicated with each other in a freer tone, thus allowing for better planning and coordination in real-time scenarios. 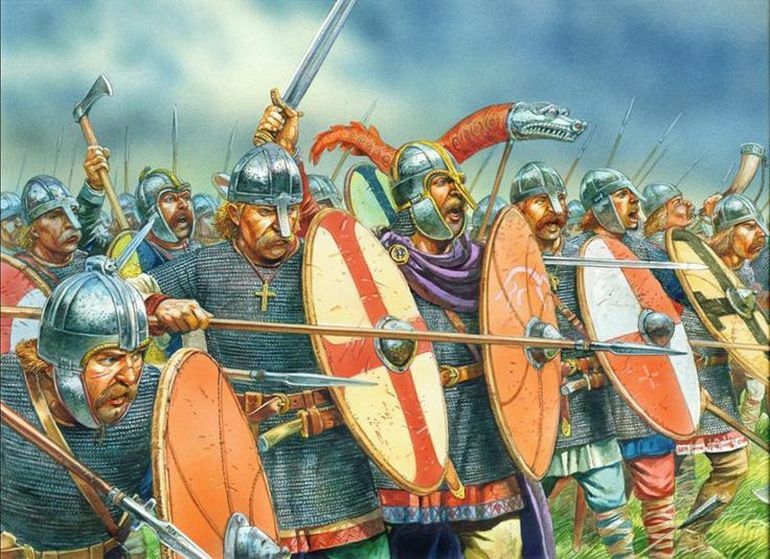 Now while then-contemporary sources are not exactly clear on the early Anglo-Saxon warfare styles and formations, a few terms in Old English hint at the possible tactical scope espoused by these warriors. To that end, the leader of a company of soldiers is often described as ordfruma (roughly translating to ‘point leader’), thus alluding to how the Anglo-Saxons used wedge formations with the commanders boldly positioning themselves at the apex, much like their ancient Germanic brethren. But such types of specific formations were probably only effective when the armies had a small number of soldiers; which suggests that the wedge was the specialty of the elite hearthweru troops. In other words, the lesser-trained fyrd was not really expected to maneuver on the battlefield with dedicated formations. However, that doesn’t necessarily mean that these levied soldiers, overwhelmingly armed with only spears and shields, were arrayed in a single massed formation. Rather they were arranged in accordance to their city of origin (like Kent and Somerset), and the men in these groups fought in their own divisions, based on their blood-ties and familiarity with each other. Over time the divisions managed to use the scildburh (or shield-fort), where the discreet yet dense (probably square-like) formations of fyrd took the field, with the better-armored men positioned in the front ranks. During the later times, the elite hearthweru and huscarls possibly ‘plugged’ the gaps between these solid scildburh formations, thus not only serving a tactical role but also fulfilling a psychological exercise where they could raise the morale of the ‘commoners’. However on other occasions, like the momentous Battle of Hastings (circa 1066 AD), the royal huscarls were probably deployed in their separate divisions. There is no doubt that later Christian values tempered the severity of many punishments of Germanic people. So while the ancient Germans practiced capital punishments for desertions (where the deserter was sometimes hanged or drowned in a bog in a secretive manner, so as to ‘hide’ his shame), the Anglo-Saxons probably didn’t go for such brutal methods. Now it should be noted that in an Anglo-Saxon warrior society, the loyalty of a thegn to his lord was viewed with utmost importance and reverence – and as such, the greatest punishment that a lord can hand out to his subject was the declaration of Nithing. The punishment of Nithing basically made the subject (usually a thegn) a ‘non-entity’, thus making him a pariah outside the perceived boundaries of the society and its laws. So in a way, he was not to have any family, companions, friends, and lord. So theoretically, the accused could even be murdered or hunted down like an animal without the interference of the existing legal framework. Intriguingly enough, a similar kind of punishment, known as damnatio memoriae, was meted out to the Roman legionaries who took the ‘wrong’ side in the frequent civil wars plaguing the late empire. They also have the well-known kind of chant that they call baritus. By the rendering of this they not only kindle their courage, but, merely by listening to the sound, they can forecast the issue of an approaching engagement. For they either terrify their foes or themselves become frightened, according to the character of the noise they make upon the battlefield; and they regard it not merely as so many voices chanting together but as a unison of velour. What they particularly aim at is a harsh, intermittent roar; and they hold their shields in front of their mouths, so that the sound is amplified into a deeper crescendo by the reverberation. Now like most of the legacies of their ancient German brethren, the baritus was probably used in its ‘modified’ form by the Anglo-Saxon armies in battle situations. One example of this can pertain to the shouts of Ut, Ut! (or Out, Out!). The adoption of Christianity also brought forth religion-fueled utterances, like Godemite! (God Almighty!) and Olicross! (Holy Cross!) – as exemplified by the warriors of Harold Godwinson, the last Anglo-Saxon king of England. 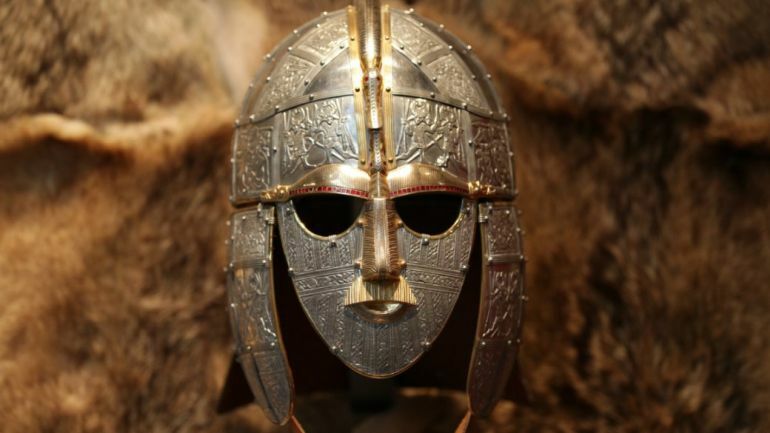 The most famous image associated with the Anglo-Saxons arguably relates to the magnificent Sutton Hoo helmet. But unfortunately, from the archaeological perspective, there are very few actual examples of helmets that had been excavated from Anglo-Saxon sites (including burial grounds). 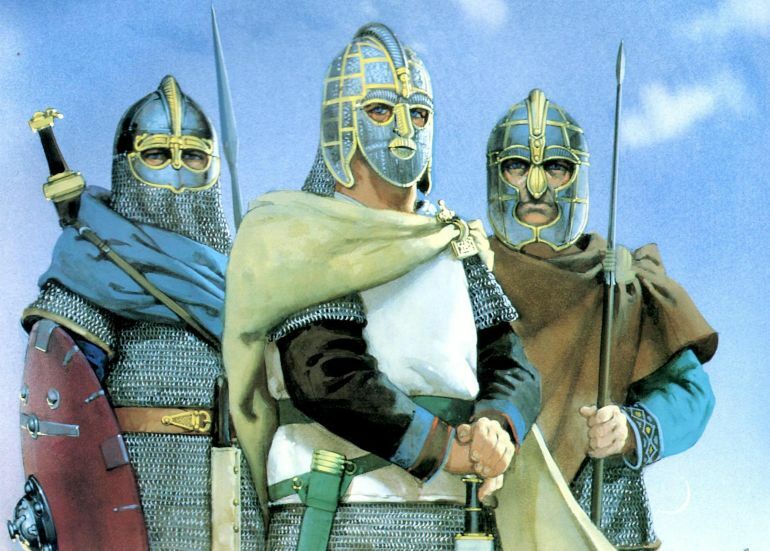 From such pieces of evidence, it can be gathered that helmets were not really the norm for ordinary Anglo-Saxon soldiers, at least till the 11th century AD. As for offensive weaponry, like most European medieval cultures, swords were viewed as weapons of honor and prestige – with the broad-bladed, double-edged variety being the predominant form used in this part of the world. And given the high status associated with swords, many of the specimens were valued as heirlooms passed down from generation to generation. Interestingly enough, the Anglo-Saxons were also known for using a variant of a blade-type weapon that was somewhere between a sword and a knife. Known as seaxes, these single-edged long knives varied in sizes, with the smaller ones used as cutlery; while the bigger ones (of 90 cm length), though lacking in pommels, were almost substitutes for swords. But beyond swords and seaxes, the most common offensive weapon obviously entailed the spear (in combination with shields). To that end, the Anglo-Saxon warriors were known to wield both throwing and thrusting-type spears, while sometimes also maneuvering a ‘hybrid’ variant that could be used both as a javelin and as a close-combat weapon. And in case we have not attributed or mis-attributed any image, artwork or photograph, we apologize in advance. Please let us know via the ‘Contact Us’ link, provided both above the top bar and at the bottom bar of the page.